The industry standard for measuring the effectiveness of self-defense ammunition is the FBI protocol. They test expansion, penetration, weight retention, and observe the simulation of wound channel effects in bare gelatin that simulates muscle tissue when prepared to specific criteria. They shoot rounds through five different barriers to show the deterioration of performance when realistic obstructions are between the shooter and the target: heavy clothing, thin steel plates, wallboard, plywood, and auto glass. When the test was first implemented, the FBI decided to go with the 40 S&W over the 38 Special that preceded it, and over the 9mm Parabellum and 45 ACP. 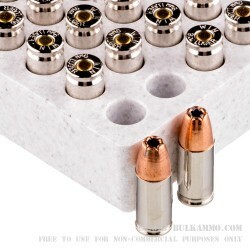 Now the winds have changed in self-defense ammunition as 9mm loads have become more advanced. The FBI chose this Winchester load as their primary service round in 2009. 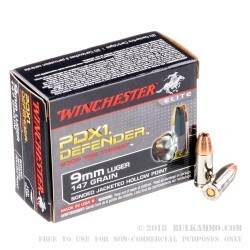 This Winchester PDX 1 Defender load carries a sub-sonic 147 grain bonded jacketed hollow point projectile. 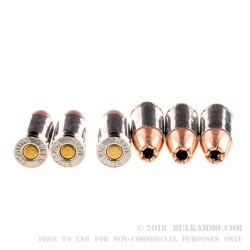 The bonded bullet has better weight retention properties and will not fragment like non-bonded hollow points might. It has excellent expansion and performs well through all the different barriers used in the FBI Protocol tests. In 2010, Winchester was awarded the 2010 Golden Bullseye award for its Supreme Elite Bonded PDX 1 Defender.